RobotUnion partners will be present at automatica in Munich, Germany from 19 – 22 June 2018. 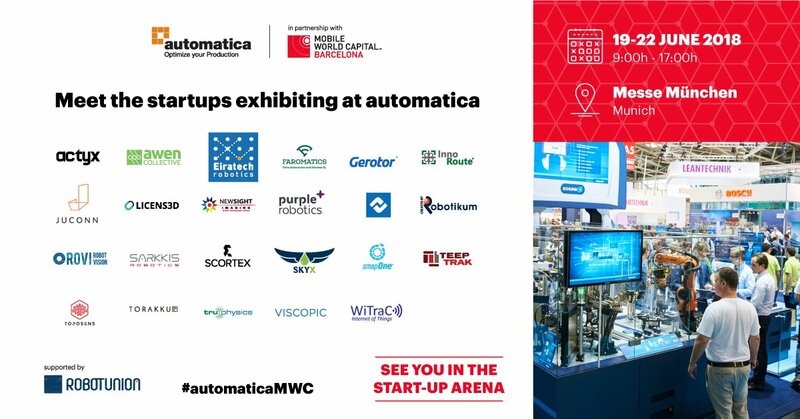 Discover the pioneering projects right here in the MWCapital Start-Up Arena and see how robotics and automation is shaping our future! For more info, click here. It aims to attract over 43,000 attendees from around 100 countries, all from various industries ranging from automotive to electronics, to metal-working and pharmaceuticals. 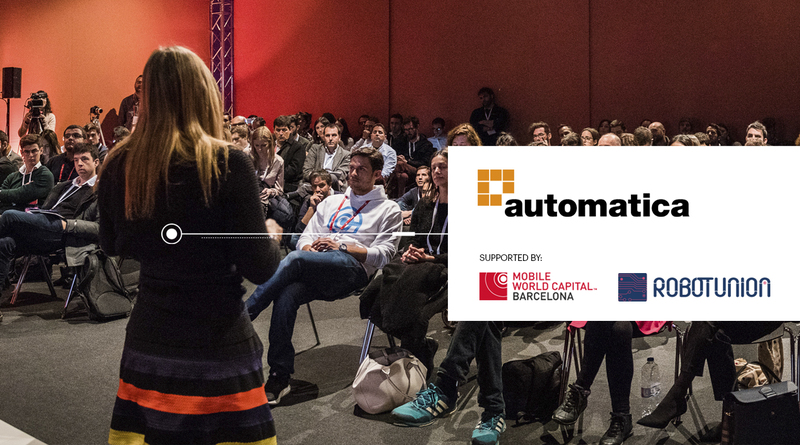 RobotUnion will have their own booth, so don’t be shy, go meet them in person and see what the acceleration programme is offering to startups and SMEs! The call is open until 3 July 13:00 CEST! The startups that will represent MWCapital over the 4 days are companies that offer robotics or smart automation for manufacturing; products or services that offer solutions to handle technologies and machinery in factories, aid industrial image processing or overall support the enhancement of the IT2Industry. All solutions are ready-for-market and use Industry 4.0 related innovative technologies such as IoT, AR, AI or Big Data. Check them out right here…..
Actyx (Munich, Germany) leads the mission of making software more accessible for factories. They offer smart applications, reliable integrations and powerful devices that are formulated into solutions for different use cases. Awen Collective (Cardiff, UK) is developing next-generation software-based solutions to help reduce the time and money spent on digital forensics and incident response on industrial control systems, such as those found in critical infrastructure (energy, water), advanced manufacturing (inc. Industry 4.0) and care robotics. Eiratech Robotics (Dublin, Ireland) is the innovator of a complete goods-to-person robotics automation platform for multiple applications, including e-fulfilment, materials handling and consumer solutions. They are very dedicated to bringing the latest in robotics technology to the Smart Supply Chain and Industry 4.0. Faromatics (Vilanova i la Geltru, Spain) develops intelligent livestock robots to increase welfare for animals, improve productivity for farmers and create less conflicting products for consumers. Their first product, the ChickenBoy, is the first world-wide roof-suspended intelligent robot that observes chickens, litter and equipment autonomously 24/7. Gerotor (Munich, Germany) provides an active energy management for the automated Industry 4.0. With this solution manufacturing companies can save up to 50% electricity costs and reduce CO2 emissions significantly. InnoRoute (Munich, Germany) is a leading edge engineering company focused on hardware and software design, offering turnkey solutions for both industry and research institutes. They offer prototyping devices and development services for hardware and software in IoT, Industry 4.0, and 5G environments. Juconn (Munich, Germany) provides a disruptive and innovative IoT platform with the focus in Industry 4.0, transportation and robotics. Licens3D (Barcelona, Spain) provides a proprietary content management and file sharing platform based on blockchain, that hinders unauthorised distribution, proves ownership and protects unrestricted reproduction of any digital assets. Newsight Imaging (Ness Ziona, Israel) develops 3D CMOS advanced image sensors for applications such as Automotive, Robotics and Industry 4.0. Purple Robotics (Odense, Denmark) There is a high demand for collaborative robot applications in the global industry, and to build a collaborative robot application requires that both robot and tooling must be applicable for collaborative operation. Purple Robotics collaborative products are made for easy and safe human-machine interaction. Rise Technologies (Cologne, Germany) offers an industrial field service collaboration and support platform. By integrating the latest communication tools and by using smart glasses and AR, their solution allows service teams to digitally work together and therefore improve machine fix-rates. RobotikUm (Umeå, Sweden) is developing a new technology for enabling dynamic manipulation in robotic systems. Such technology will be keystone in automation of delicate tasks and operations that require grasping, manipulating, handling external objects or external environments. RoVi Robot Vision (Munich, Germany) aims to make intelligent robots available to everyone to help with manual work in manufacturing, in the office and at home. This goal requires robots with greatly increased sensitivity and perception capabilities, but with simplified hardware. SARKKIS Robotics (Porto, Portugal) is a software company focused on the development of offline programming software for industrial applications. Scortex (Paris, France) deploys artificial intelligence in the heart of factories. They help their customers take the next big leap in smart automation using their quality intelligence solution. The deep learning platform, provides a state-of-the-art performance and robust vision solution for quality intelligence. Skyx (Ramat HaSharon, Israel) is an agricultural-robotics technology company enabling a modular swarm of autonomous drones for spraying. The innovative solution enables variable rate application at hotspots, or uniform coverage of an entire farmland. smapOne AG (Hannover, Germany) helps you turn your ideas into apps. smapOne enables you to shape and optimise your business processes and utilise them anytime, anywhere. Toposens (Munich, Germany) has developed the world’s first 3D ultrasound sensor, which allows for unique applications such as 3D close-range object detection for autonomous vehicles or robots. Torakku Technologies (Barcelona, Spain) has been built with industry needs in mind. Torakku combines the best location and identification technologies to feed an intelligent, highly scalable and flexible IoT based real time location system, that registers the movements and position of the desired asset, with high precision and with minimal infrastructure and maintenance costs. TruPhysics GmbH (Stuttgart, Germany) is focused on research into real-time physics simulation, development of digital twins and machine learning algorithms in robotics. Their vision is to develop autonomous robotic applications to support people in their daily tasks in industry, logistics and services. Viscopic (Munich, Germany) is a software company specialised in the field of mixed reality technologies and CAD data processing. In short, Viscopic delivers a “PowerPoint for mixed reality”. Witrac (Valencia, Spain) aims to be the technological suppliers and experts of tracking for the Industry 4.0. Plus, Skyx and Witrac are both startups that have been part of the European Commission-backed IMPACT Growth acceleration programme, with Skyx also being mentioned as one of the 12 best agritech startups by Nocamels. All startups that are part of the MWCapital delegation will get a branded booth within the Start-Up Arena and the opportunity to pitch their product/service on stage during the daily pitching sessions. The Exhibiting Startups Pitches will take place from 11:00 – 12:30hrs on Tuesday 19 June and Wednesday 20 June at the Start-Up Arena Stage. The Startup Competition Finale will take place from 11:00 – 12:00hrs on Thursday 21 June and will highlight the 5 best finalists who will get the opportunity to win either a booth at 4YFN Barcelona 2019 or enter an exclusive acceleration programme to get up to €223K equity-free funding via the European Commission initiative, RobotUnion. RobotUnion will also host their own info session on the morning of 21 June (10:15 – 11:00hrs), to inform entrepreneurs and CEOs on how they can accelerate their startup with equity free funding and VCs and will close the programme on Thursday with a networking reception from 12:00 – 13:00 hrs.